In Catalonia, the sculpture was an art well consolidated since the middle age, and consequently a lot of centuries before the Modernisme (Art Nouveau). 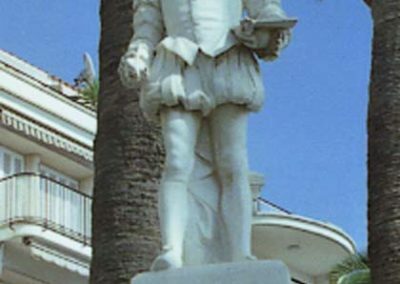 Effectively beginning already in the century XIII with figures as Bartomeu, Aloi de Montbrai or Guillem de Sagrera, passing through Damià Forment, the Catalan sculpture had in the XIX century lots of artists developing there art with a notable technical perfection and in some cases with genius. We refer, for example, to figures as Salvador Gurri and Damià Campeny that are the base of what later will generate the expansion of the important academicism “realistic” school with sculptors as the brothers Agapit and Venanci Vallmitjana, Fuxà or Reynés that at the same time will evolve toward and live together with the Modernism (Art Nouveau). Art Nouveau was a brilliant liberation of shapes. In front of previous rule – the academicism -, Art Nouveau means freedom, the possibility to develop any shape, any color, any idea. The sculpture was not an exception. The expression of figures showed the life in all its varieties in front of cold academicism representations. Catalan Art Nouveau followed also the same criteria and filled the houses, the streets, the squares, the theatres, the hospitals, the churches with that new concepts. – One as an architectural decorative art being part of buildings. – Another expression with an independent personality, free of architectural compromises. Both manifestations had a magnificent expression in Catalan Art Nouveau, and the artists had been developed normally both and frequently other closed specialties like medals design. The atelier of brothers Agapit and Venanci Vallmitjana was the origin of Catalan Art Nouveau school of sculptors. There, Josep Llimona made studies to improve his art knowledge’s previously started in Llotja. 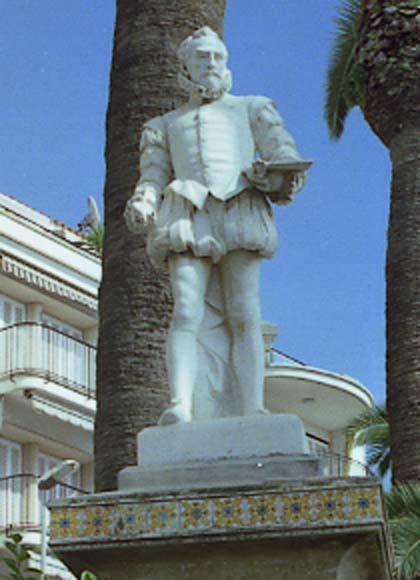 Llimona is one of better examples of Catalan Art Nouveau sculpture. Eusebi Arnau is also a big sculptor developing his activity together with architects, specially Domènech i Montaner, his artworks made frequently with the help of Alfons Juyol, are present in Barcelona and in all Catalonia. 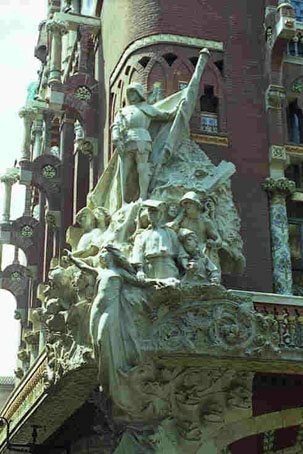 Miquel Blay was also a collaborator of Domènech i Montaner, in particular in the Palau de la Música Catalana where in a façade angle his brilliant sculpture “Popular airs” is represented. Pau Gargallo born in Maella (Aragó) near Catalonia in 1881, was the disciple of Eusebi Arnau, working in his workshop. He had excellent relations with artists frequenting the “Quatre gats”, as Nonell, Picasso and others. His contacts through Arnau with Domènech i Montaner were the base of his collaboration in making the sculptures of buildings as Palau de la Música Catalana and the Hospital de Sant Pau. Gargallo artworks was made not only in stone, but also in tick metal. Nevertheless, Pau Gargallo is something different in Art Nouveau Catalan sculpture, because at the end of his unfortunately short life, he sculpts figures out of figurative standards making the sculpture not a strict copy of reality. Reynés is not properly an Art Nouveau sculptor as explained up and not popular as Llimona, Arnau or Gargallo, but some of his artworks are known because placed in popular areas as in Sitges – Monument to El Greco – and Triumph Arch in Barcelona. Other artists as Carreres and Clarasó had also an important participation in art development during the Art Nouveau period.